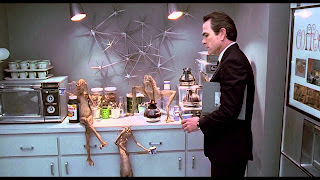 A science-fiction comedy with an edgy wit, Men In Black offers a funky premise and irreverent attitude delivered in a polished package. 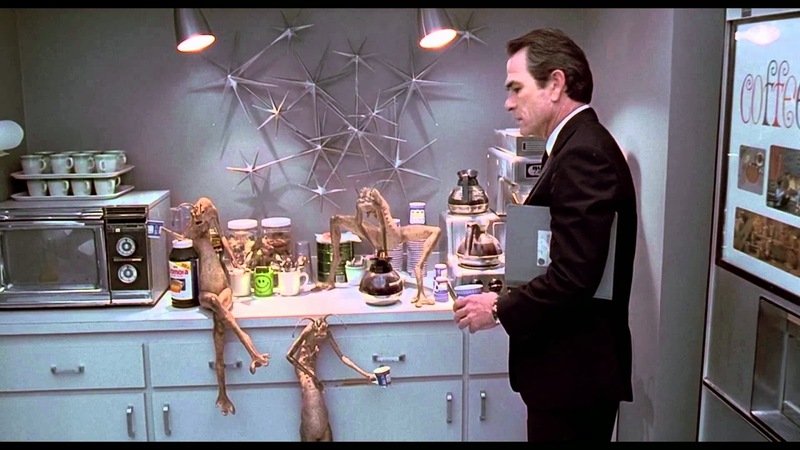 Agent K (Tommy Lee Jones) works for the cryptic Men In Black (MIB) government agency responsible for secretly settling and managing the affairs of refugee aliens on Earth. While most aliens are peaceful and integrate into society disguised as humans, the few troublemakers are hunted down and disciplined or deported by MIB. To replace his ageing partner, K recruits athletic and resourceful New York Police detective James Edwards (Will Smith) into the agency, and he becomes Agent J. And just in time. An inter-galactic dispute between two alien races threatens to erupt into an all-out war. Edgar The Bug (Vincent D'Onofrio), a mammoth cockroach-like evil alien, crash-lands in a rural field, clumsily takes on a human skin, and proceeds to steal a precious artifact belonging to the Arquillians. An Arquillian space armada threatens to blow up Earth unless their gem is returned to them. Agents K and J team up with medical examiner Dr. Laurel Weaver (Linda Fiorentino) to track down and eliminate Edgar before the Arquillians unleash their weaponry. Men In Black is a ridiculously enjoyable romp. Based on a comic book, the story is fresh and fun, filled with opportunities for the imagination to go wild. And the Ed Solomon script is packed with weird and wonderful action, laughs and wisecracks, while director Barry Sonnenfeld doesn't waste a second and delivers the movie in a compact 98 minutes. The film introduces a pen-like device that erases the memory in a flash of light, flying saucers hidden in plain sight, aliens giving birth in the back seat of a car, miniature galaxies, monitors filled with well-known celebrities outed as aliens, and one unforgettable weapon recovery attempt. It's a non-stop visual feast of creative ideas, assembled into a remarkable outside-the-box world that suddenly becomes real. 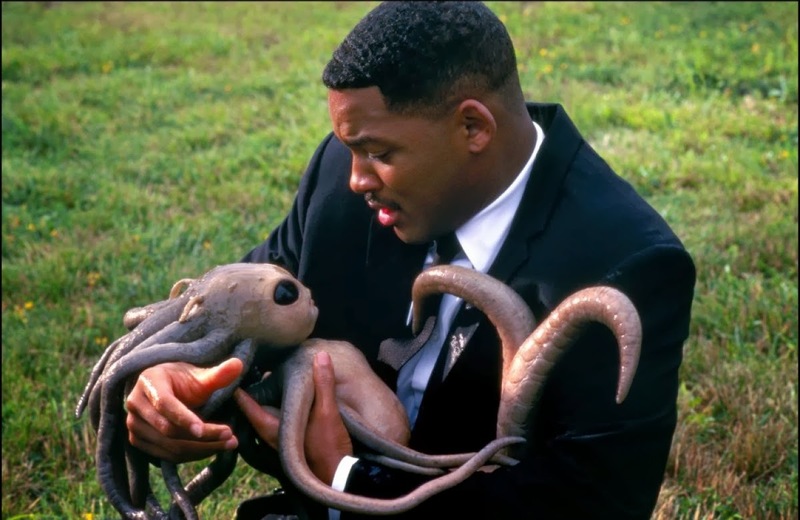 After his breakout success in Independence Day, Will Smith enhances his stardom with a confident, cocky and razor sharp portrayal as Agent J. Mixing bewilderment at the strange world of MIBs with supreme self-confidence, Smith gets the best lines, delivers the most energy, and oozes cool. Jones is the perfect foil for Smith, laid back, stoic, and deploying his experience with the gnarled resignation of too many years chasing after too many aliens. Linda Fiorentino plays up her screen persona as the dark and mysterious woman very much up for something different, and does she ever get her fill of different here. Fiorentino gets her share of zingers as Dr. Weaver becomes an unwitting participant in a desperate attempt by the MIBs to terminate a really large cockroach. Perfectly dressed in supposedly bland suits that stand out for their distinctive retro appeal, the Men In Black always get their alien.